Green Fluorescent Protein (GFP), originally isolated from the jellyfish Aequorea victoria, is a 238 amino acid protein that is of great interest to life scientists. Although there are numerous reports that show the use of traditional purification approaches to purify GFP, these are either multi-step or require expensive chromatographic resins. Recently, several groups have used the relatively new and simple "three-phase partitioning" (TPP) approach to purify various proteins, including GFP. TPP approach relies on the use of ammonium sulfate and t-butanol to separate the components of the lysate into three phases. Under appropriate conditions, the protein of interest can be precipitated into the interfacial phase (between the top t-butanol and the bottom-aqueous phases). In the present study, we have used 10 organic solvents in addition to t-butanol in the TPP approach in an attempt to develop a relatively simple and high-yield purification method. 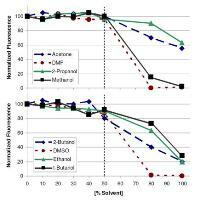 The solvents tested in this study were methanol, ethanol, 2-propanol, acetone, dimethyl sulfoxide, dimethyl formamide, 2-butanol, t-butanol, 3-methyl-1-butanol, 1-butanol, and hexanol. We found that surprisingly, GFP was quite stable and fluorescent in all the solvents tested (up to 50% v/v). Additionally, we found that 6 of the solvents tested were effective in TPP purification of GFP, with 2-propanol, t-butanol, and 3-methyl-1-butanol being the best solvents to use. In summary, we show that the use of alternate organic solvents in TPP may lead to development of simple and high yield purification methods for GFP as well as other proteins.